The Topps 2017 Pro Debut set includes 15 cards highlighting the road-trip adventures of MiLB.com's Benjamin Hill. The Topps Company and MiLB.com, the official site of Minor League Baseball, announced today the release of a first-of-its-kind "Ben's Biz" insert set highlighting the adventurous travels of MiLB.com reporter Benjamin Hill. The 15-card set is part of the Topps® 2017 Pro Debut set, also released today. During his decade-plus of covering Minor League Baseball for MiLB.com, Hill has traveled to nearly 150 Minor League ballparks, experiencing America through the lens of these communities. Along the way, he has met some of the nation's "superfans," participated in crazy on-field stunts and contests and experienced some the of the Minors' renowned ballpark fare. 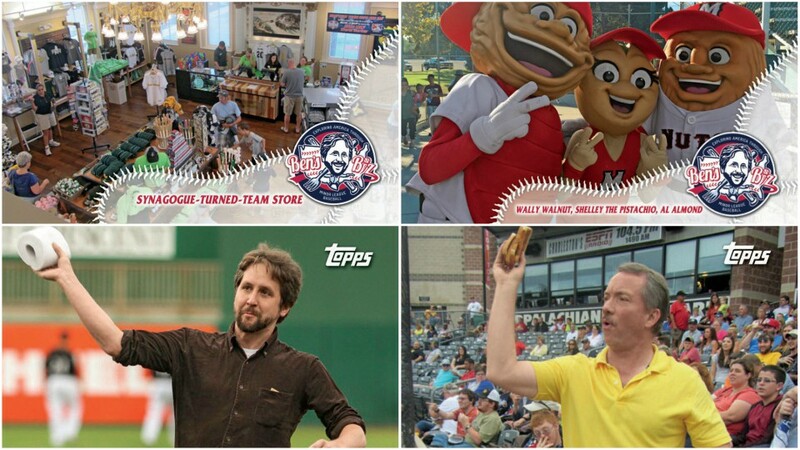 "We love that the Ben's Biz cards represent the heart of Minor League Baseball showcasing not only the great game, but also the entertainment that occurs off the field that bring families to the ballpark," said Topps Brand Manager Zvee Geffen. "Growing up, I was obsessed with Topps® baseball cards and they played a huge role in my evolution as a fan. To now partner with Topps is, quite literally, a dream come true," said Hill. "The Ben's Biz insert set is unique, and often quite weird, and my hope is that it inspires others to explore America through Minor League Baseball." All of this and more are featured within the 15-card Ben's Biz insert set. Hill will be providing context and background to each card at MiLB.com, through his blog (https://bensbiz.mlblogs.com/) and on Twitter (@bensbiz). Check back regularly for more content related to this groundbreaking insert set. 2017 Topps® Pro Debut features a 200-card base set of players from throughout Minor League Baseball. Baseball fans will have a chance to explore the world of MiLB through the various insert sets in addition to the Ben's Biz cards, including cards dedicated to special promo nights uniforms and Fragments of the Farm relic cards, which contain a unique item found at various ballparks embedded in them. Find 2017 Topps Pro Debut at local hobby stores, Target, Walmart, online retailers and select Minor League ballparks.